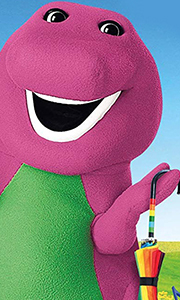 Own Barney - A Super Dee Duper Day DVD from Deff, DVD, Blu-Ray & 4K Video Specialists - Free UK Delivery..
Own Barney - Dinomite Birthday DVD from Deff, DVD, Blu-Ray & 4K Video Specialists - Free UK Delivery..
Own Barney - Happy Birthday Barney DVD from Deff, DVD, Blu-Ray & 4K Video Specialists - Free UK Delivery..
Love makes Barney's world go 'round, and the huggable dinosaur encourages his friends to express and understand their emotions in healthy ways. From creating masks to decorating a "Friends & Family Tree" with hearts, Barney uses fun songs and games to help his friends get in touch with their feelings. And he reminds them that manners, sharing and taking turns are great ways to show you care about others. It's always a happy day of fun a..
Own Barney - Imagine With Barney DVD from Deff, DVD, Blu-Ray & 4K Video Specialists - Free UK Delivery..
Own Barney - Lets Go To The Moon DVD from Deff, DVD, Blu-Ray & 4K Video Specialists - Free UK Delivery..
Own Barney - Marvellous Manners DVD from Deff, DVD, Blu-Ray & 4K Video Specialists - Free UK Delivery..
Own Barney - Paint It Purple DVD from Deff, DVD, Blu-Ray & 4K Video Specialists - Free UK Delivery..
Own Barney - Play With Barney DVD from Deff, DVD, Blu-Ray & 4K Video Specialists - Free UK Delivery..
Own Barney - Please And Thank You DVD from Deff, DVD, Blu-Ray & 4K Video Specialists - Free UK Delivery..
Own Barney - Read With Me! Dance With Me! DVD from Deff, DVD, Blu-Ray & 4K Video Specialists - Free UK Delivery..
Own Barney - Riffs Clubhouse DVD from Deff, DVD, Blu-Ray & 4K Video Specialists - Free UK Delivery..
Barney is a loveable hero brought to life in beautiful flowing animation. Barney is gentle but clumsy he has his head in the clouds and dreams of stardom and fame - the gold star on his collar helps to remind him of this. In his long, shaggy white fur lives Roger, a streetwise mouse, always quick to point out the opportunities Barney would otherwise have missed. Along with Mr. Prophet, Barney's pessimistic friend and the two puppies Los..
Own Barney - Way To Go! DVD from Deff, DVD, Blu-Ray & 4K Video Specialists - Free UK Delivery..